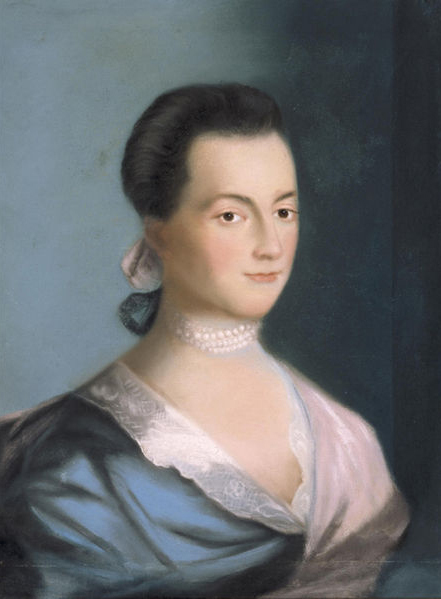 Portrait of a young Abigail Adams. "The Pulitzer Prize–winning, bestselling biography of America’s founding father and second president that was the basis for the acclaimed HBO series, brilliantly told by master historian David McCullough. In this powerful, epic biography, David McCullough unfolds the adventurous life journey of John Adams, the brilliant, fiercely independent, often irascible, always honest Yankee patriot who spared nothing in his zeal for the American Revolution; who rose to become the second president of the United States and saved the country from blundering into an unnecessary war; who was learned beyond all but a few and regarded by some as “out of his senses”; and whose marriage to the wise and valiant Abigail Adams is one of the moving love stories in American history. This is history on a grand scale—a book about politics and war and social issues, but also about human nature, love, religious faith, virtue, ambition, friendship, and betrayal, and the far-reaching consequences of noble ideas. Above all, John Adams is an enthralling, often surprising story of one of the most important and fascinating Americans who ever lived." From Amazon.com. "An intellectual dialogue of the highest plane achieved in America, the correspondence between John Adams and Thomas Jefferson spanned half a century and embraced government, philosophy, religion, quotidiana, and family griefs and joys. First meeting as delegates to the Continental Congress in 1775, they initiated correspondence in 1777, negotiated jointly as ministers in Europe in the 1780s, and served the early Republic--each, ultimately, in its highest office. At Jefferson's defeat of Adams for the presidency in 1800, they became estranged, and the correspondence lapses from 1801 to 1812, then is renewed until the death of both in 1826, fifty years to the day after the Declaration of Independence. Lester J. Cappon's edition, first published in 1959 in two volumes, provides the complete correspondence between these two men and includes the correspondence between Abigail Adams and Jefferson. Many of these letters have been published in no other modern edition, nor does any other edition devote itself exclusively to the exchange between Jefferson and the Adamses. Introduction, headnotes, and footnotes inform the reader without interrupting the speakers. This reissue of The Adams-Jefferson Letters in a one-volume unabridged edition brings to a broader audience one of the monuments of American scholarship and, to quote C. Vann Woodward, 'a major treasure of national literature.'" From Amazon.com. "In 1762, John Adams penned a flirtatious note to "Miss Adorable," the 17-year-old Abigail Smith. In 1801, Abigail wrote to wish her husband John a safe journey as he headed home to Quincy after serving as president of the nation he helped create. The letters that span these nearly forty years form the most significant correspondence―and reveal one of the most intriguing and inspiring partnerships―in American history. As a pivotal player in the American Revolution and the early republic, John had a front-row seat at critical moments in the creation of the United States, from the drafting of the Declaration of Independence to negotiating peace with Great Britain to serving as the first vice president and second president under the U.S. Constitution. Separated more often than they were together during this founding era, John and Abigail shared their lives through letters that each addressed to "My Dearest Friend," debating ideas and commenting on current events while attending to the concerns of raising their children (including a future president). Full of keen observations and articulate commentary on world events, these letters are also remarkably intimate. This new collection―including some letters never before published―invites readers to experience the founding of a nation and the partnership of two strong individuals, in their own words. This is history at its most authentic and most engaging." From Amazon.com.